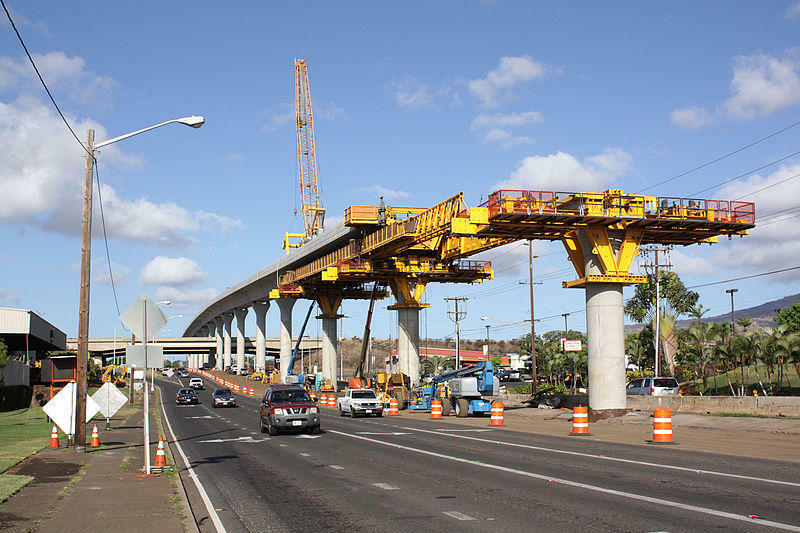 This shot from 2015 in Waipahu near Fort Weaver Road clearly shows the elevated rail pillars and guideway system that is planned to extend through downtown Honolulu. (Reporter's Note: The majority of this interview is taken from the third recording session I had with former Mayor Mufi Hannemann in the Fall of 2016. For this session, he brought in Toru Hamayasu, former Chief Planner, Transportation Planning Division, Department of Transportation Services. Hamayasu’s career in City transportation began in the Frank Fasi administration in 1972, he has worked under five mayors in various capacities. Originally, Mr. Hamayasu came only as a resource person, but later agreed to recording on content and procedural issues. Whether you agree with it or not, this is a civil discussion of what happened according to two key participants. I invite you to read the transcript of the entire conversation. Muliufi "Mufi" Hannemann was Mayor of Honolulu from 2005 to 2010. 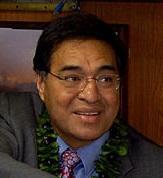 Former Honolulu Mayor Mufi Hannemann was elected in 2004. Hamayasu says he was convinced by a poll at the time. N: What was wrong with the bus alternative at that point? Hamayasu: Nothing wrong with the bus alternative, that’s why we carried it as an alternative in the AA. Going back to why are we doing the rail in the first place? Because it’s cheaper to operate than the comparable bus system to provide the same capacity . The bus obviously requires bus drivers. We have a formula. For each bus we add we have to hire 2 bus drivers and ¾ mechanic. So labor cost is 60-80% of the operating cost. Any attempt to reduce that is a smart thing to do. N: You know, I was really compelled by that at first, but then I began to run across numbers, especially about an elevated guideway system, with the security guards and the maintenance of corridors and structures, really the costs of all that are quite huge as well. I was kind of dissuaded that the two persons were as much of a problem as they are often made to be. You’ve got to hire security guards, maintenance people for these stations and they’ve got to be maintained 24 hours as well. Hamayasu: Well, there’s a lot of analysis done on that, half of it done by people who don’t like rail. Some are based on the National Transportation Data book (NTD). One study showed that out of 26 systems in the US, 22 show that the rail cost is cheaper than the bus, per passenger. This was a mixture of rail systems from heavy rail to light rail, any kind of rail system. N: Any kind of rail system? You know what, I have seen numbers that are not like that at all. Numbers are so hard to compare, it seems. Hamayasu: Right, that’s why I’m saying that out of 26 systems, 22 show the cost of rail is less. What was the first decision, that we could not go at grade? That was one of the givens? Hamayasu: Right, because of impact to the streets and lessening the traffic capacity and the difficulty in construction, trenching work. And it cannot be automated, so it compromises the operating costs. You cannot run at-grade downtown without substantial negative impact to the surface traffic. How many streets do we have? Ala Moana, King St., Beretania, Vineyard, Dillingham that’s it. Essentially, you have to take 4 lanes out of one of those streets, not two. N: So, the first decision was that we could not go at-grade and that got us to elevated. Hamayasu: Elevated or tunnel, exclusive right of way. N: And you’re sure that at-grade would have just cost us more in terms of land acquisition, construction costs…? Hamayasu: Like trenching through downtown where there would be tons of Hawaiian burials. A column, a six-foot hole every hundred feet… Hawaiians didn’t bury deep, so if we find them, we can shift the columns or even split them. So that’s why this technology makes sense in terms of lessening the impact to the burials. I’m convinced of that. Nobody likes the visual thing, right? But, what are the choices? We can do tunnel. It actually has a tunnel alignment. N: So, the thinking was, if we’re going to have it elevated, we could have whatever technology we chose for power? And we did get the most expensive one. Everywhere I read, this particular technology is 4 times as expensive as any other rail technology. Hamayasu: Not because of the third power line. I don’t know what documents you’re looking at. N: 4 times more expensive than the average light rail cost. Hamayasu: Oh, that could be attributed to many things. In Hawaii, everything costs double. N: But in any jurisdiction, it costs 4 times as much. Hamayasu: I don’t know if that’s comparing oranges to oranges. And, there are a lot of systems that don’t include the kind of costs we have to go through. A lot of cities had the advantage of available right of way. We were frustrated by why it cost so much, but that’s not because of the technology, it’s because we’re constructing through a dense corridor. If you look at the isolated section of the Washington Metro through downtown, how they had to dig it, or even the Boston system, I’m pretty sure they’re not cheap. And I think the New York D-line is costing almost $1 billion a mile. It’s an expensive project because of the kind of things we have to do, not because of what we bought. Hannemann: As much as people may find it hard to believe, this wasn’t done for political reasons. It is a difficult thing to do. It’s the last thing I should have done if I was being political; too risky, too difficult, and you’re going to have people dislike you. A trophy legacy was the last thing on my mind. It was, this is the missing piece in our quality of life. Everybody who comes here says the same thing about our traffic. And every time you look at this, from in office or out of office, it always came down to rail. And the question was, should it go elevated or at grade? I’m convinced, having all the experts at my disposal when I was the mayor, and even now as people talk to me about it and I continue to be very interested in the project, this is the only way to go. And we have a commitment we have made to the federal government to go with a certain system that they endorsed. If they had problems going with an elevated system, if they preferred the system proposed by the architects, they would have said to us, we like this.